Joint post of Henri Bergius and Michael Marth cross-posted here and here. 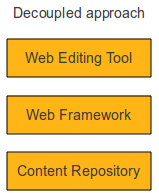 Web Content Repositories are more than just plain old relational databases. In fact, the requirements that arise when managing web content have led to a class of content repository implementations that are comparable on a conceptual level. During the IKS community workshop in Rome we got together to compare JCR (the Jackrabbit implementation) and Midgard's content repository. While in some cases the terminology might be different, many of the underlying ideas are identical. So we came up with a list of common traits and features of our content repositories. For comparison, there is also Apache CouchDB. transactions Multiple content modifications are written in transactions. Transactions can be used optionally.